I’ve only just begun recapping our vacation, but I have to take a quick break because we were on the road again last weekend. 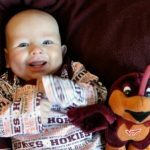 This blog generally runs a week or two behind real life, except when real life intersects with current events, like Virginia Tech football. 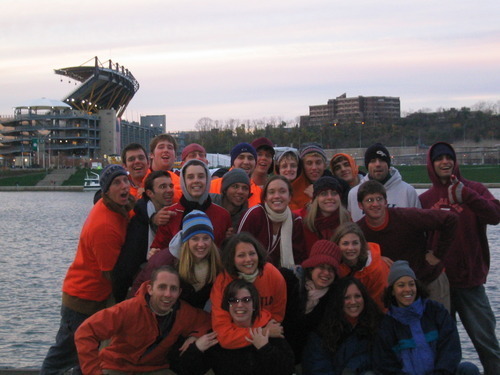 We went to Pittsburgh for the Virginia Tech game last weekend. The weekend started with a beautiful wedding celebration on a boat. David partied all night long, and I wore heels for the first time since I got pregnant. 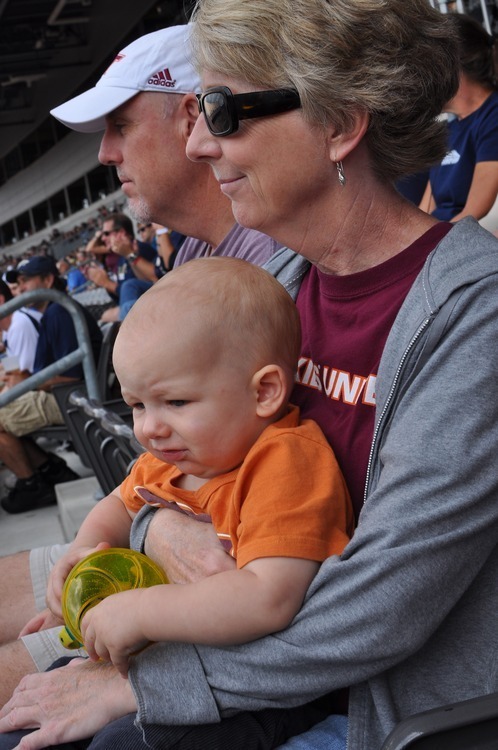 A Virginia Tech game – David’s first football game – would be a great way to extend the festivities. We took these photos before kickoff, when the game was still fun. This was the third time Tom and I have seen Virginia Tech play in Pittsburgh, and I’m not sure why we thought this year would be different. The first time was in 2001, the second was 2003; last weekend’s debacle fit right in. 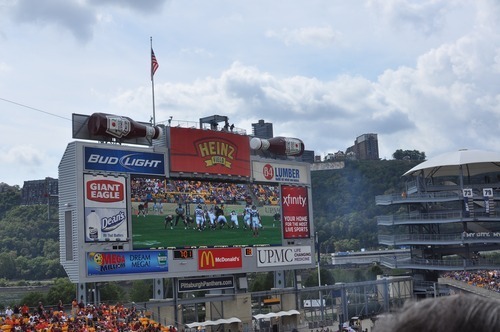 Pittsburgh plays at Heinz Field, the Steelers’ stadium. 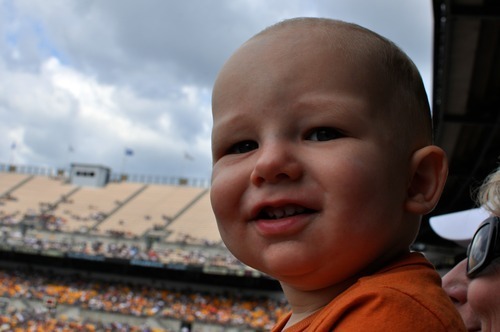 It’s a great place to watch a game; the stadium is beautiful and there’s a nice view of the river and Mt. Washington. 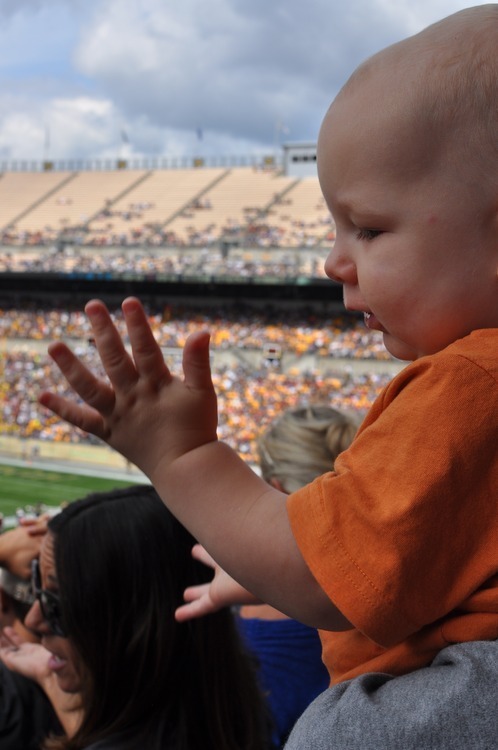 And unlike Lane Stadium, babies get in free at Heinz Field. If you haven’t been to Pittsburgh you should know one thing: the people that live there are the nicest people in the world. Think of the nicest person you know, people from Pittsburgh are nicer. Pittsburgians (Pittsburghians? Pittsburghers?) don’t know strangers, they’re welcoming and genuine and down to earth. But something happens to Pitt fans when they’re watching their team upset Virginia Tech. They seem to forget who they are. I’ve been to a lot of away games, and the Pitt fans in 2001 and 2003 were some of the most hostile fans I’ve ever seen. I want to be clear: This isn’t normal for Pittsburghanders, it only happens in this unique environment. This game was different. We had rockstar parking, amazing seats, access to the club (thanks, Andy!) and the fans were, like, cool. I’m saying all this for my friends who were with me in 2001 and 2003. We barely escaped with our lives and have been telling survival stories ever since. The 2012 fans were polite, cordial, gracious winners. David learned to clap a while ago, but it sort of fell out of fashion with him. 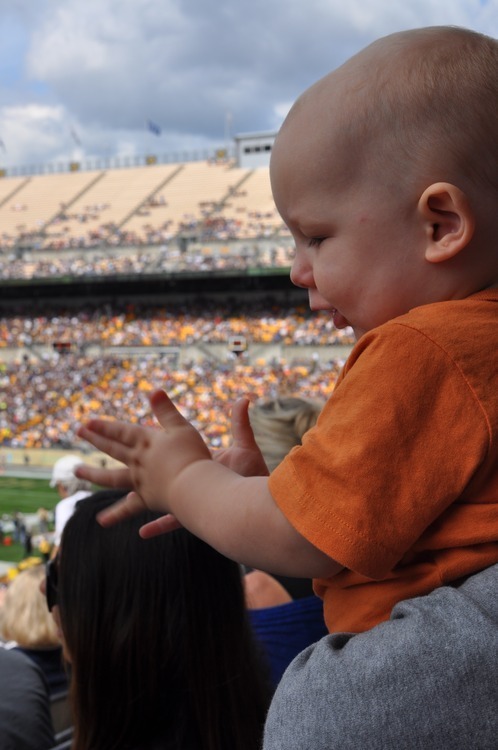 During the game we were sitting with Pittsburgh fans, and suddenly he started clapping again. 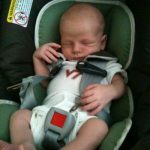 If we’d been sitting in the Virginia Tech section that never would have happened; our team wasn’t giving anyone much of anything to clap about. The night before the game David was up until almost 10pm. Then on game day he missed both of his naps. In adult terms, this combination of exhaustion and over-stimulation would be like skipping four days of sleep then being asked to read Anna Karenina at a Jay-Z concert. By the third quarter, his eyes were watering, his nose was running, his face was blotchy, but he still refused to admit he was tired. At the end of the fourth quarter, he passed out in Mimi’s arms for about 20 minutes. The game was difficult, but you probably already knew that. After the game we sat in the stadium for a while and tried to figure out what had just happened. Then we left and had pizza and peanut butter cookies with family; wonderful, boisterous, family who know the sun doesn’t rise and set with Hokie football. Thank goodness. 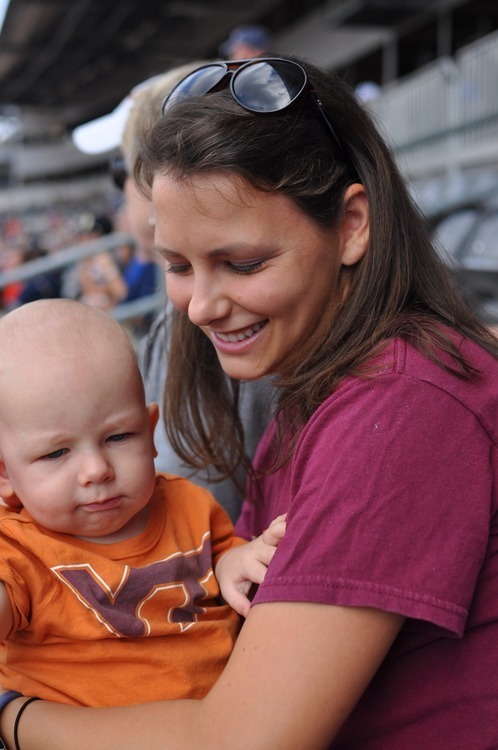 Tom says we’re never going back to Pitt for a VT game. Our track record is bad enough already. I say: Until we meet again, Steel City. i cannot BELIEVE that david sat through an entire football game. i can’t even do that. wow. Reading this confirms that yes, Saturday’s game actually did happen. ugh.On a positive note: David looks so much like you!! !